Why track your company expenses? It is a well known fact that our company budget is something to stay on top of. This entails being aware of each team member’s individual expenses at all time. 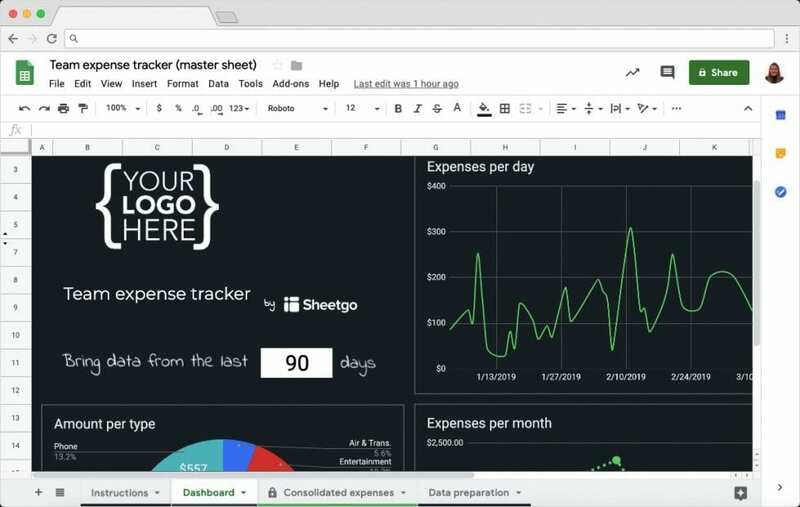 This Expense tracker template in Google Sheets will help you doing just that and even more. 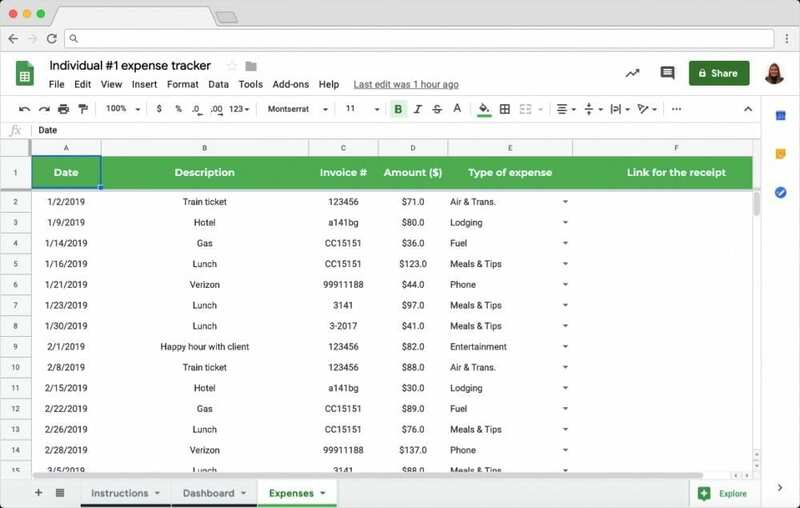 The easiest way to track real-time expenses is in spreadsheets. 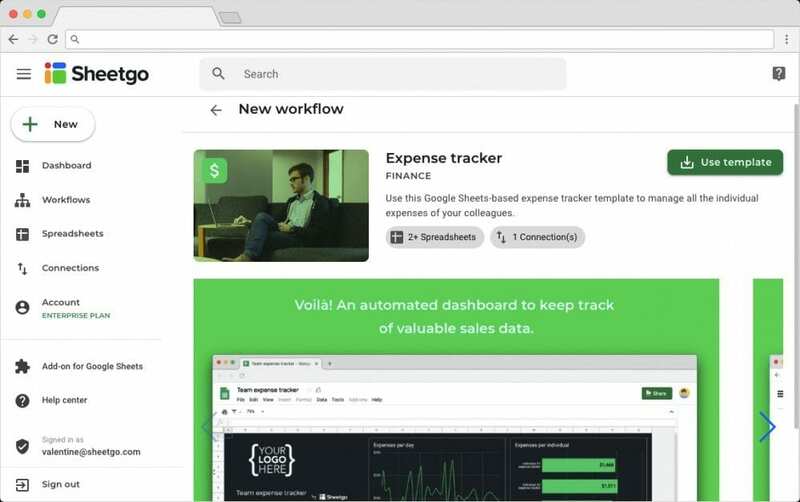 Let this system automate the consolidation of team expenses, and use the dashboard to easily and visibly monitor the situation. 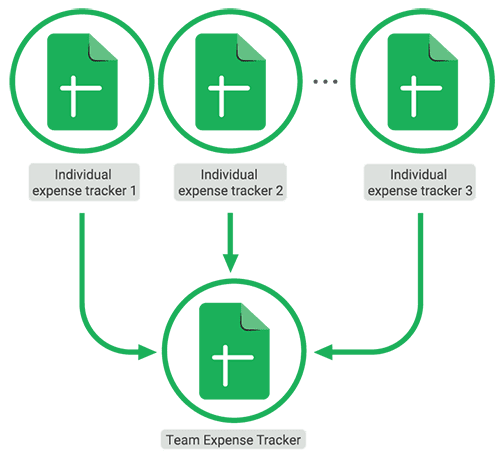 The template consists of a master spreadsheet “Team expense tracker” to easily monitor all of your colleagues’ expenses. The information comes from separate input spreadsheets per individual (e.g. “Individual expenses 1”) and is consolidated into this one master file. The template is provided with some sample data for you to overwrite with own information. This information automatically flows into a dashboard and uses relevant metrics to analyze each team member’s expenses. Install the Expense Tracker Template by clicking the button above. You will be asked to log in using your Google account. Your Sheetgo account will also automatically be created. After doing so, click on the ‘Use Template’ button to install the template. The system is now automatically installed inside your Google Drive by Sheetgo. The individual expense tracker spreadsheets are stored in one folder called “Team expenses spreadsheets”. These are consolidated into the master spreadsheet “Team expense tracker”, as seen on the image below. If you need more individual expense spreadsheets, simply copy one of them and make sure to store them inside the same folder. The connection consolidates the data from the entire folder so the system will keep running. 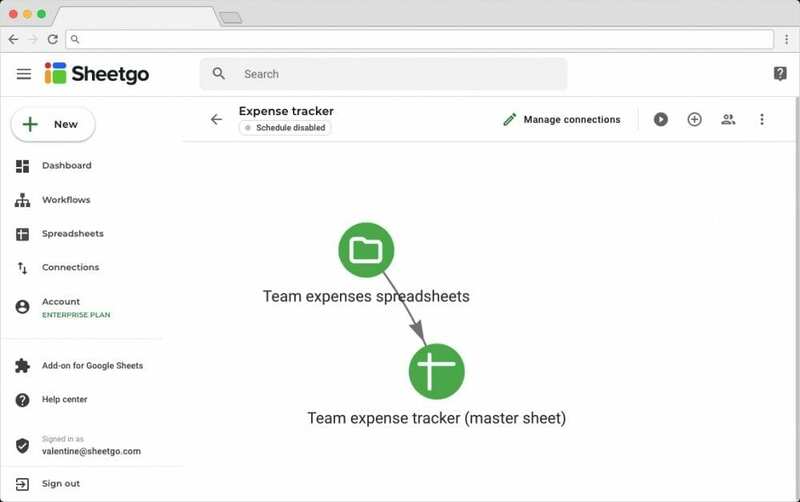 Click on the spreadsheet and folder icons to open both the “Team expenses spreadsheets” folder and the “Team expense tracker” spreadsheet. These are stored inside a Google Drive folder. Inside the “Team expenses spreadsheets” folder you will find 3 Individual expenses spreadsheets, provided with sample data for you to overwrite. Inside the input spreadsheets, “Individual expenses 1” for example, you will find instructions on how to use the template. Each team member simply fills out their individual expenses in the “Expenses” tab and can track their own expenses on a personal dashboard. Once your team has filled out their individual expenses, update the consolidate connection. Go back to the Sheetgo Web Application and click on the play button ‘Run workflow’ to do so. 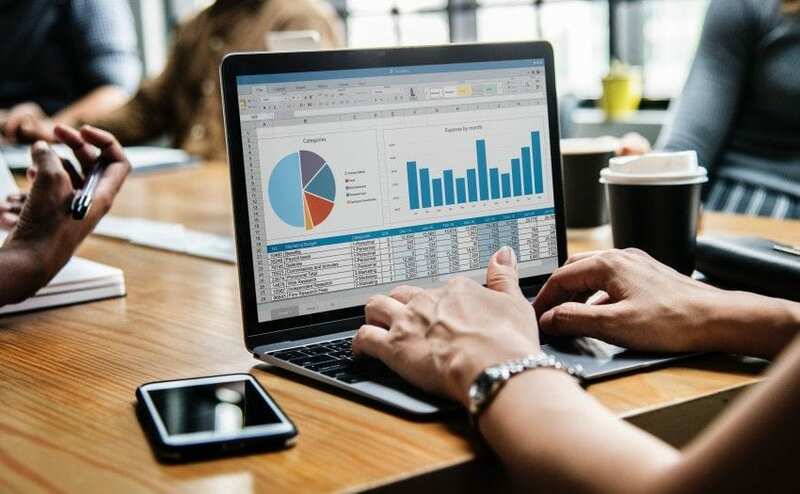 This will automatically bring the data into the master spreadsheet, where you will find all consolidated expenses and a dashboard to easily monitor them. You’ve successfully configured your Expense tracker template in Google Sheets. Feel free to customize according to your team’s needs.